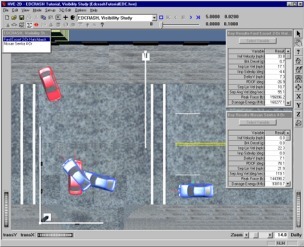 EDCRASH is a reconstruction analysis of single- or two-vehicle accidents, including collision. Based on the CRASH model developed at Calspan and extended by NHTSA, EDCRASH also includes several enhancements developed by EDC, including hard spots on the vehicle exterior and an extensive set of run-time diagnostics that help confirm valid results. EDCRASH primary purpose is to determine impact speed and delta-V (a measure of impact severity) based on accident site and vehicle damage measurements. EDCRASH is also well-suited for collisions with immovable barriers, such as bridge abutments and large trees. EDCRASH has been validated using the RICSAC collision experiments, a set of 12 well-instrumented staged collisions. Several validation studies have been published in the technical literature. EDCRASH is a 2-D, 3 degree-of freedom (X,Y,PSI) analysis for each vehicle. For oblique impacts, EDCRASH uses the conservation of linear momentum; for collinear collisions, vehicle damage is used in conjunction with crush stiffness coefficients derived from barrier crash testing. The impact-to-rest phase is analyzed using energy methods and a modified Marquard method allowing for the effects of vehicle rotation and curved trajectories. The impact-to-rest phase may also be confirmed by a trajectory simulation. First introduced in 1984, EDCRASH has since become universally recognized as the industry standard reconstruction program. No other reconstruction program has been so well documented, validated and critically reviewed as EDC’s EDCRASH. Numerous validation studies are published in the technical literature. Selectable from HVE-2Ds built-in databases, according to Type (Passenger Car, Pickup, Sport-Utility, Van, Truck and Fixed and Movable Barriers), Make, Model, Year, Body Style. Driver Controls (wheel lock-up, steer angle, rotation/lateral skidding and pre-impact braking). Simulation Controls (integration timesteps and termination conditions). Vehicle Damage (CDC, PDOF, width, depth, offset, and impulse center). Accident History (positions and velocities at each path position: begin braking, impact, separation, final/rest). Vehicle Data (dimensions, inertias, stiffness coefficients, tire properties, wheel lock-ups). Program Data (complete listing of user-entered scene data). Site Drawing (display of vehicle impact and rest position, end of rotation, point on curve and key data). Damage Profiles (display of vehicle damage outline and key damage data). Momentum Diagram (vector diagram of pre- and post-impact momentum).